PXT Select’s suite of reports helps organizations to select, onboard, coach and develop employees. You receive all these reports with one assessment. 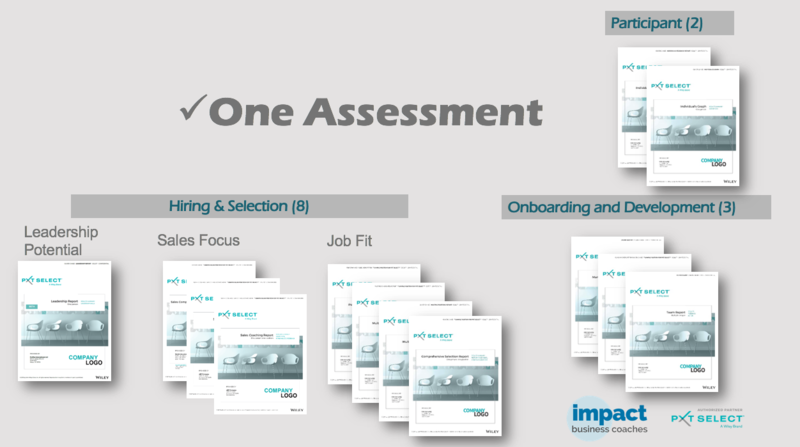 Understand the range of scores and behaviors for the position you’re trying to fill. Learn about the ideal candidate for that role. This report is customized for each position. Have a sales team? The following reports provide a view of critical sales practices and incorporate sales language to help organizations hire, onboard, and develop their sales people. Wish you had insight into how a candidate leads? Great for hiring but also for leadership development, this report illustrates how an individual’s personal characteristics, strengths and challenges relate to six distinct Leadership Skills relevant in today’s workplace. Contact us for more information about the Enterprise Package for your organization. PXT Select™ Expert Practitioner Certification is your best resource to gain foundational knowledge and invaluable tools for using the PXT Select™ Assessment, the suite of reports, and understanding its impact in your organization. With a primary purpose to increase confidence and expertise when implementing PXT Select™, this online course allows you the flexibility of self-paced learning, paired with live, virtual classroom sessions led by Wiley expert trainers. Additionally, you will have continued access to the online PXT Select™ Training Center learning center to use as a resource when needed. Accessible from computer or tablet, this online program gives you the flexibility of self-paced learning paired with a live, virtual classroom experience that is engaging and immediately applicable in your workplace.Upon successful completion of this course, you will receive the credential of PXT Select Certified Practitioner. You also receive 12 SHRM PDCs with this course. Demonstrate the ability to effectively partner with stakeholders using PXT Select and be able to analyze an organization’s needs and design the most appropriate PXT Select process. Deepen your understanding of the PXT Select Assessment and selection reports. The focus of this course is to give participants expertise and confidence to implement PXT select within their organizations.